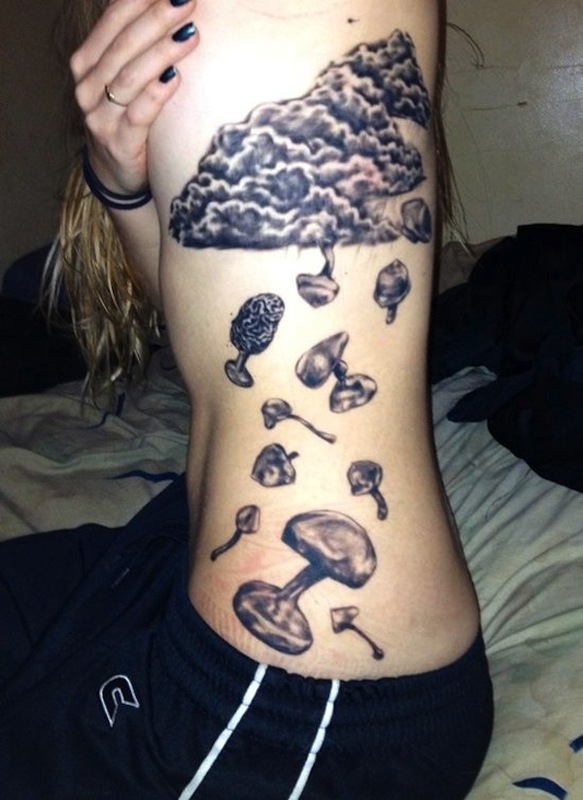 I've always enjoyed mushroom art but mushroom tattoos really captures my attention as well. 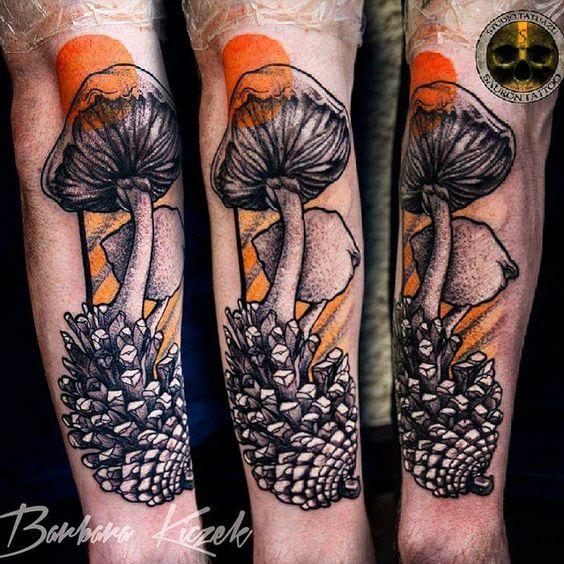 For a person to ink a mushroom on their precious skin, you know mushrooms has blessed or enhanced their life in some positive way, very cool! 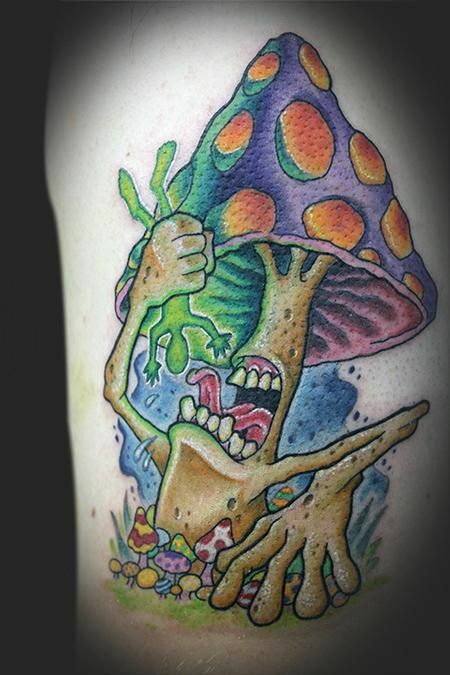 I have posted some of the mushroom tattoo photos I have collected for everyone to enjoy. 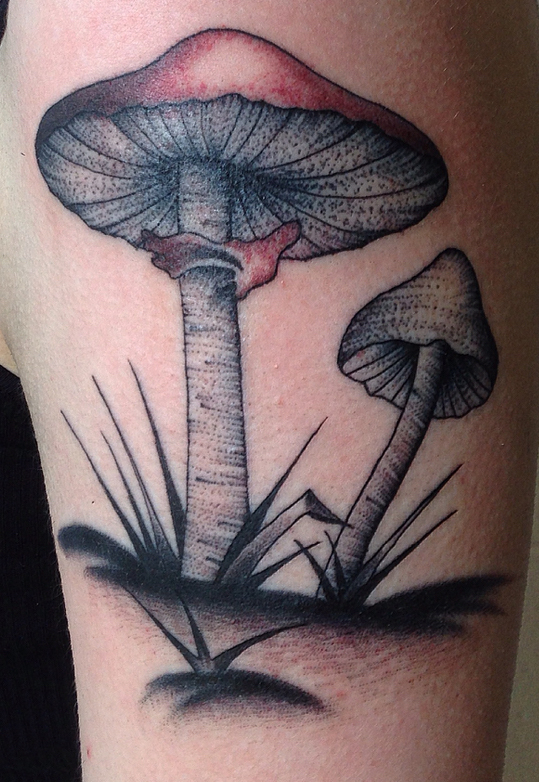 If you have a mushroom tattoo(s) and would like to share with everyone, please email them to me. You will earn free mushroom spores if you want them. 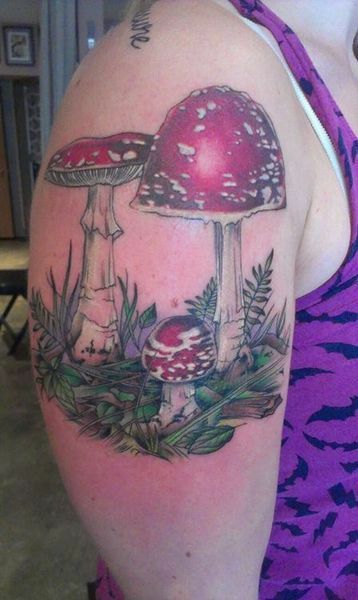 For every mushroom tattoo you have you may have a free spore print or syringe of your choice from our catalog. 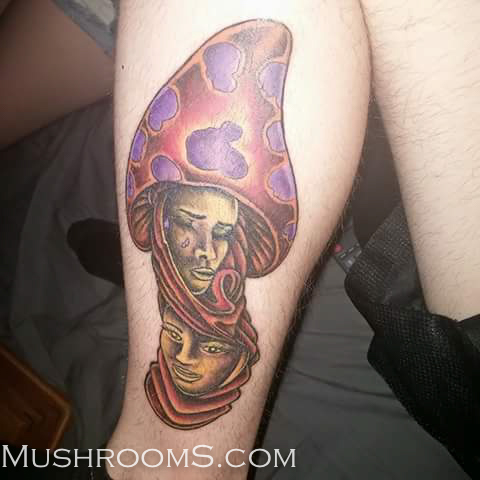 If you have a cool mushroom tattoo you want to share you can upload the photos at the end of the blog. Better yet, here is a challange. 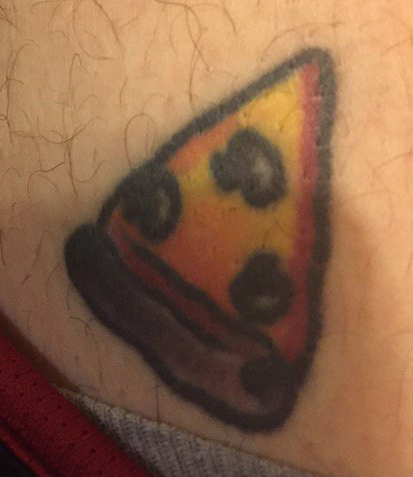 Mushrooms.com will pay for your mushroom tatoo if it's part of our logo! You start the work, send us the bill and we'll remburse you! And if you do something really large we'll pay you $500 to $1,000 (plus tat costs) depending on the size! Food for thought. 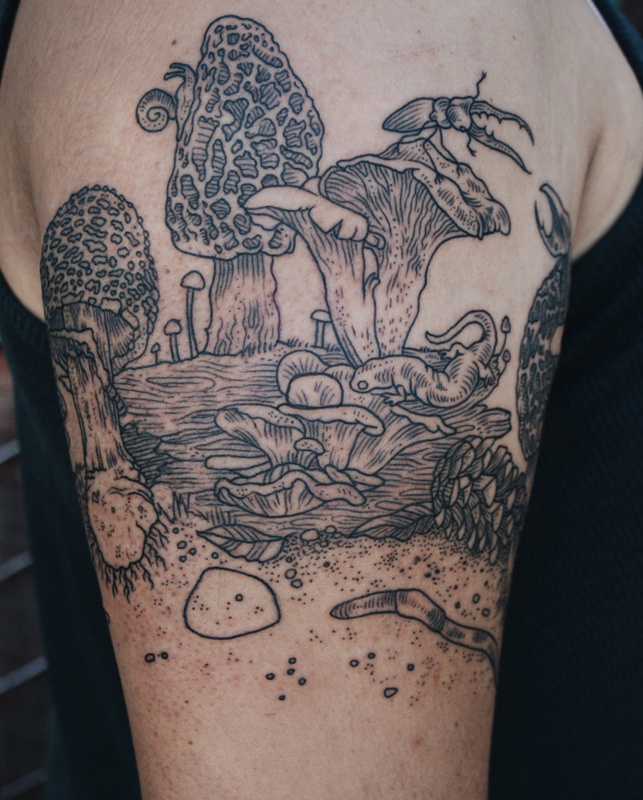 This is on one of my favorite mushroom tattoos I have seen, the Alice in Wonderland theme. Such great color and detail and so many cool psychedelic mushrooms! These were sent in to me anonymously so I don't know who she is but she is super cool in my book! 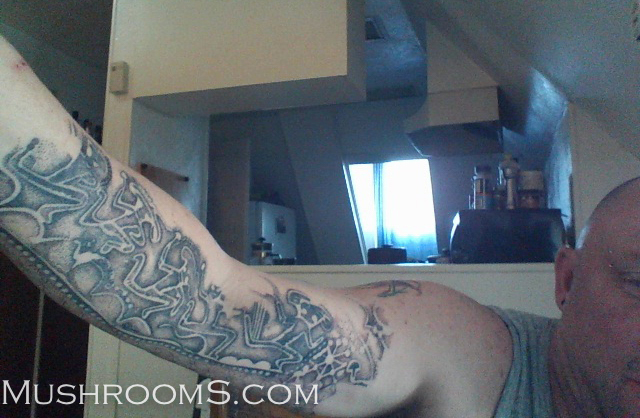 Submitted by Mark; The tattoo down Marks arm is an extension of the Fungus Man tat on his head. That had to hurt, hopefully you had plenty of shrooms to deal with that pain Mark. 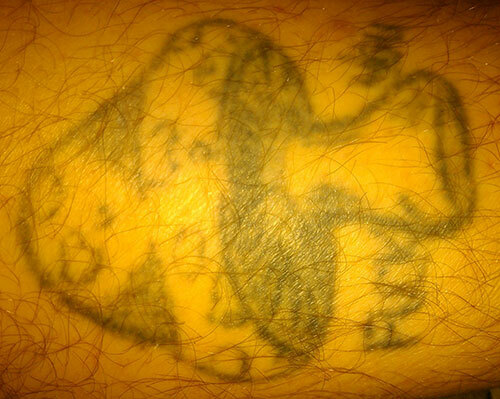 This next cool mushroom tattoo is from a cave drawing about 5,000 years old from Southern Algeria. This region of the world now is the Sahara Desert, but at the end of the ice age it was a tropical oasis with plenty of water from melting glaciers. This is believed to be the oldest drawing reference to mushrooms on earth. It’s believed the shaman in his bee mask is representing the relationship between storing psilocybin mushrooms in bee honey, which has been documented for thousands of years in that part of the world. The Egyptians had references to this as well. Have you ever tried blue honey? Amazing way of storing those fresh shrooms and eating the preserved blue honey later. This cave drawing was believed to be from a shaman sanctuary of that time period. Hunters Baby. Submitted by Hunter. 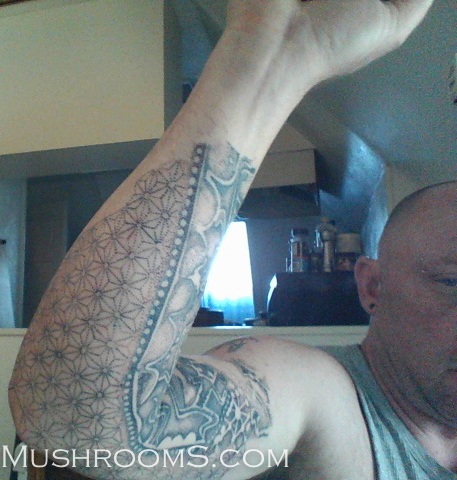 Hunter says: Original idea by him and hand sketches by him self while influenced by the magic mushrooms themselves. The top face represents a "bad trip" of source, while the bottom represents, or course, the much beloved "good trip". Thank you so much for this opportunity to both share my beloved art piece and receive a prize for it as well! I love your work, my good sir!. Keep on keepin' on! 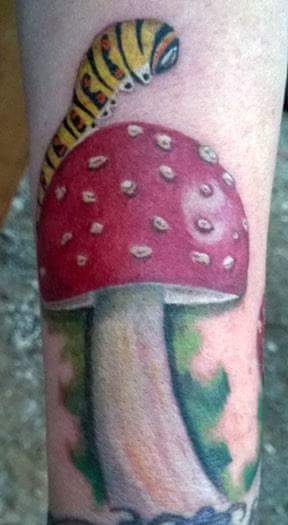 Snow Dogs Studio tattoo artist gave his wife this cool Amanita Muscaria shroom tattoo. 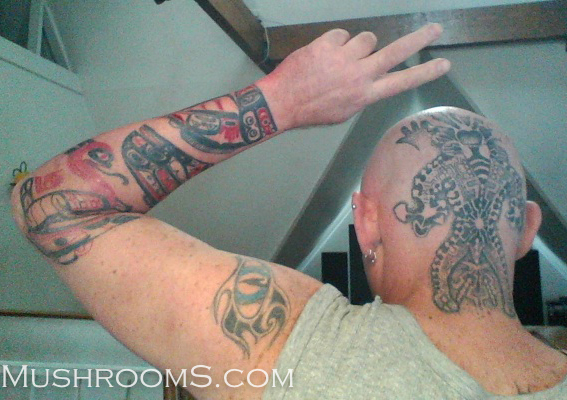 These beauitful tattoos are by tatoo artis Tony Rein Hardt. You can see more of her work on Tumbler. amanitas and semilanceatas, (libert caps). 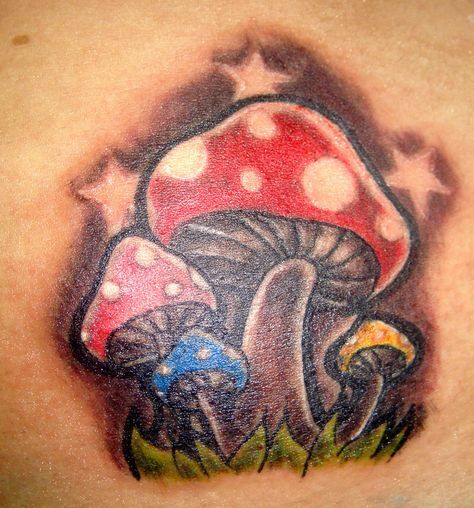 I found lots of mushroom tattoo that appear to be Marioland inspired. 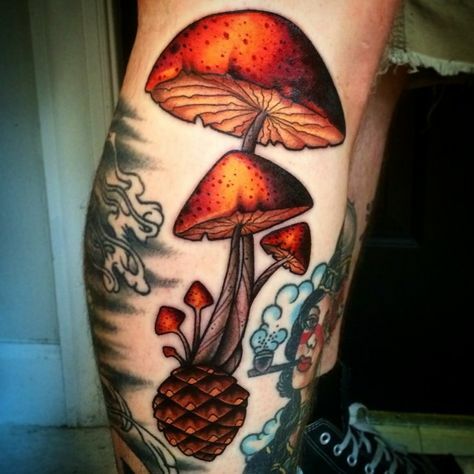 A mushroom pine cone :) Psilocybe Subaeruginosas are known to grown on pine and pine needles. 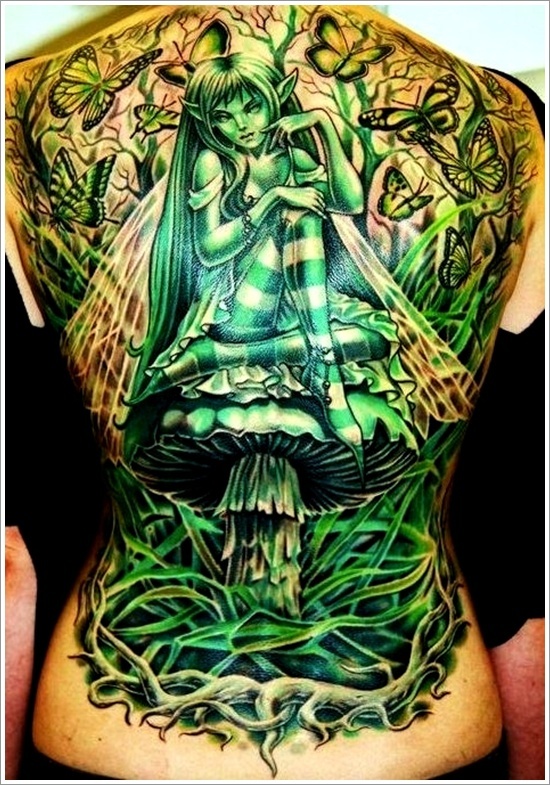 Awesome fairy on mushroom, that is some really nice skin art. 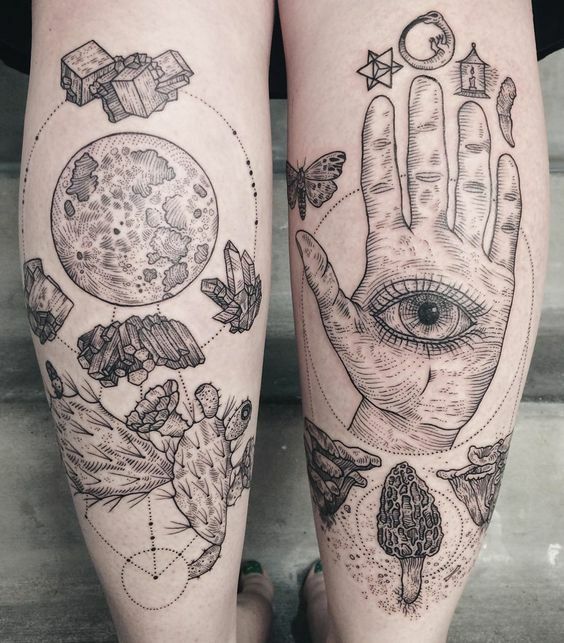 Tattoo by Tattoo Easily. Looks like this toad found to many magic mushrooms! 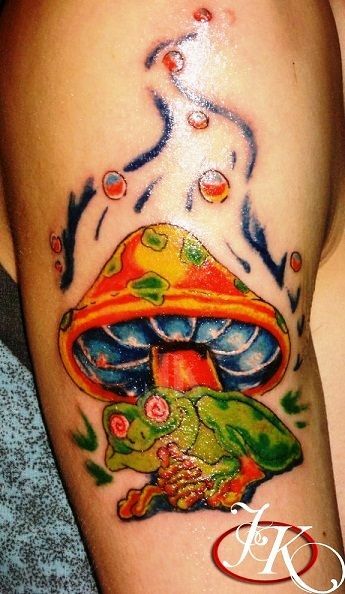 Amantia muscaria tattoo on the toungue, unbelievable! 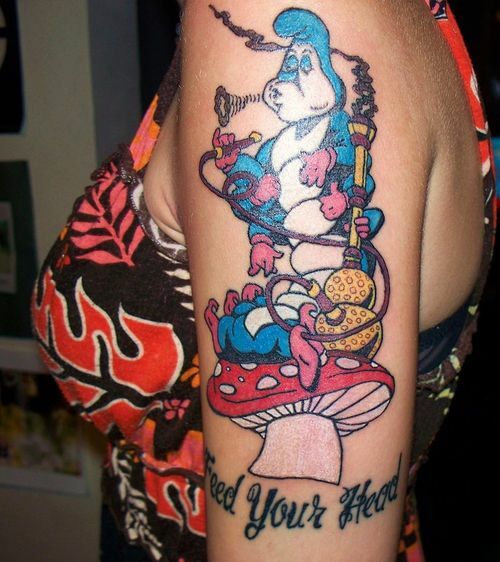 Feed Your Head another great Alice in Wonderland tatto. Nice tatts! Thank you for sharing! Wish I have the courage to face the needles! My cat in her hand made fungi blanket. This is a painting I did about the shared genetics between fungi, plants, and animals and the randomness of the circle of life.